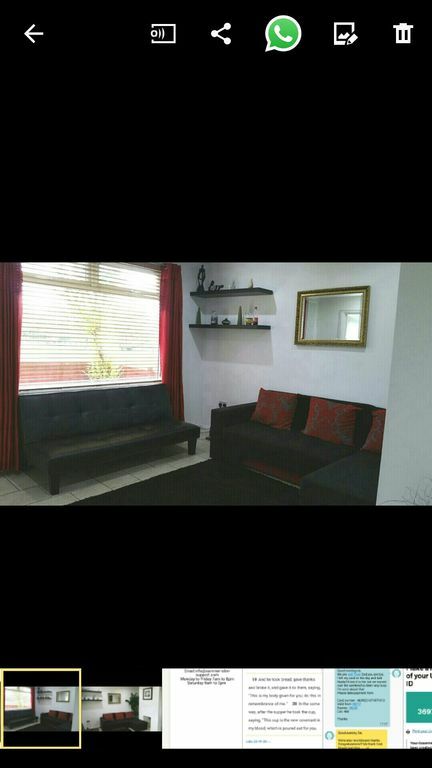 This is a 3 bedroom terraced apartment with tiled flooring downstairs and laminated upstairs. It boasts of a beautiful kitchen with the necessary amenities such as cooker, fridge freezer, washing machine, microwave, toaster, utensils and other things you'd expect to have in a kitchen. A beautifully furnished conservatory and dining area. It has a king size bed in one of the rooms, two single beds in the other and one single bed in the third room. We have additionally, 2 sofa beds in the living room and the property can host up to 7 guests. If you are looking for somewhere to stay with your family or on a business or work assignment, look no further as we have all you'll need to make your stay comfortable.